As Colin Kaepernick’s job hunt has crept into training camp, the parameters of debate have shifted. Just a few months ago, the contention was over whether or not Kaepernick was good enough to play in the league. That no longer seems to be the case. Last week, reports circulated that Baltimore Ravens head coach John Harbaugh and general manager Ozzie Newsome were both interested in signing Kaepernick, but were met with resistance by owner Steve Bisciotti, who framed hesitance over signing Kaepernick as a PR concern. Kaepernick’s ability to play the position no longer seems to be in doubt. Players have spoken in support of Kaepernick, and most serious analysis reliant on game study arrives at the conclusion that Kaepernick is not just a competent quarterback, but is also better than he was when he led the 49ers to the Super Bowl in 2013. Cian Fahey, who catalogues quarterback performance at Pre-Snap Reads, found Kaepernick to have outplayed Ravens starter Joe Flacco. And yet Kaepernick doesn’t have a team. It’s obvious Kaepernick is being frozen out for his political opinions, but it’s less apparent how extraordinary it is that a player like him can’t find a team. Back in March, Neil Paine and I wrote about Kaepernick’s situation and noted that it was strange for even a halfway decent quarterback to remain unsigned so deep into free agency. Four months later, it’s no longer merely unusual — it’s practically unheard of. No above-average quarterback has been unemployed nearly as long as Kaepernick this offseason. The most comparable scenario — Ryan Fitzpatrick’s contract showdown with the New York Jets last offseason — isn’t really comparable at all, since Fitzpatrick was the one exerting leverage over the team, not the other way around. It’s easy to lose sight of the reality that good quarterbacks often never even reach free agency, let alone remain unsigned for so long. That’s especially the case for our discussion of Kaepernick, which has shifted from his merit as a player to concern-trolling and a consideration of business practicalities. 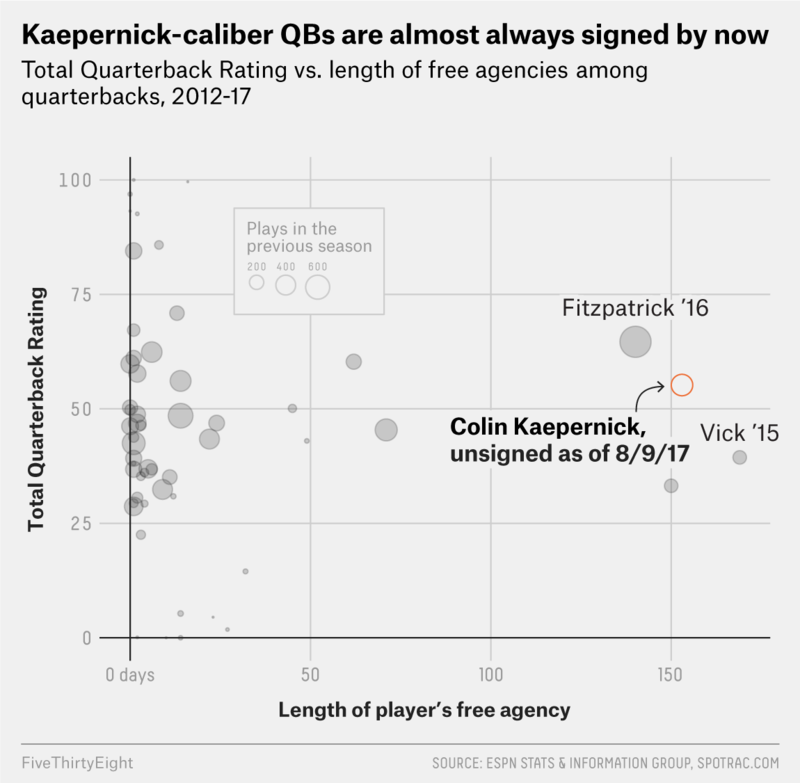 So while Kaepernick is clearly an outlier on the chart above, the fact that he’s on it at all should be just as surprising.